Valve works in mysterious ways. Last year, they held a big DOTA 2 event for Halloween, then didn't do it this year. People got angry. Last year, they didn't do anything for Christmas, because Christmas got stolen. This year, they are. Go figure! 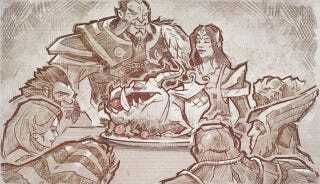 What it means is that DOTA 2 players are in for a Holiday season of themed events and gifts. Unless Frostivus gets stolen again.